Were you asked to bring dessert in your office party or family get together? Can’t really decide what to bring that’s delicious but super easy to make? Why not try this graham float recipe but with a twist! When we here graham float, we automatically imagine either 3 main ingredients as the star of the dish; we think of Fruit Cocktail float, or the classic Mango float. But what if we tell you there’s another recipe of graham float you can do that is equally or even more delicious than the typical floats we make. The star of this Graham float with a twist is Strawberries! 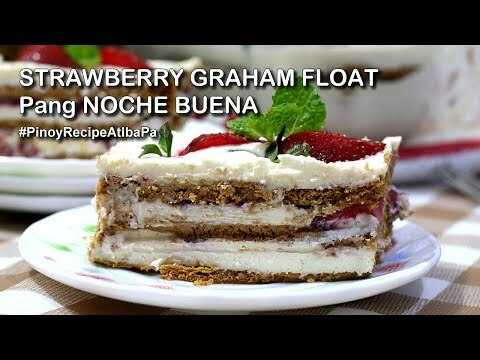 Yes, you will learn how to make Strawberry Graham Float! This recipe basically entails the ingredients that a normal graham float would but it’s the star of the dessert that is different. Even if we’re only changing/adding one ingredient, it really creates a different flavor profile for this dish. Start learning it and watch your friends and family thank you for creating this delicious Filipino dessert! Strawberry Graham Float Recipe is another twist from the original Mango Float dessert, this time we used Strawberries. This recipe basically entails the ingredients that a normal graham float would but it’s the star of the dessert that is different. We used a square baking dish in making this Graham Float. First slice the Strawberries that will be used for fillings and toppings. Whip Frosty Whip Cream Powder with cold water, all-purpose cream and sweetened condensed milk. In a mixing bowl, combine whip cream powder with cold water, then whipped until light and double in size. Add in chilled all-purpose cream, sweetened condensed milk, vanilla extract then, mix until well combined. Divide the whipped cream mixture into 3 parts, so you can have a 3-layer graham float. Arrange graham crackers in your baking dish. Lay the crackers flat and even until you cover the whole bottom of the baking dish. Pour 1 part of the vanilla cream mixture on top and spread evenly and arrange the Strawberry slices. Place another layer of graham crackers, followed by vanilla cream and arrange another slices of strawberries and repeat process for the last time, ending with a cream. Refrigerate for 30 minutes until set. Decorate it with reserved Strawberry slices on top and some mint leaves. Make sure to chill for at least 8 hours or overnight to set completely before serving. Strawberries are rich in a number of nutrients that promote good health, including fiber, vitamins, minerals and antioxidants. The nutrients found in Strawberry are linked to reducing inflammation, decreasing risk factors for obesity-related diseases, and protecting you against heart disease and certain types of cancer. Strawberries can be bought at leading supermarkets in the Philippines but they are only available when in season. Strawberry Graham Float Recipe is another twist from the original Mango Float dessert, this time we used Strawberries. glad I found this recipe, I just a kilo of strawberry from Baguio City… I will make this tomorrow when we get home from our trip.